A lifelong student of nature, Alan has spent many hours in the field - from central Kansas to the Rocky Mountains of the West. 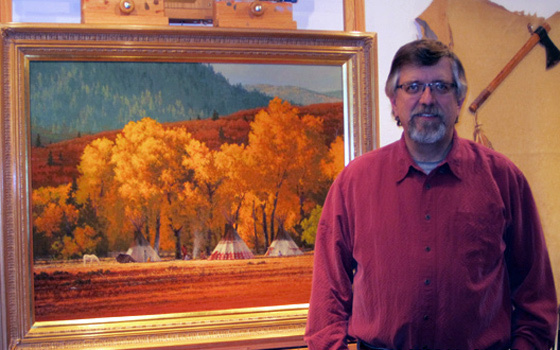 It is his love of the outdoors that compels Alan to focus on wildlife, landscape, and Native American art. Growing up in the open country of northwestern Kansas, in the small town of Bird City (located in Cheyenne County), Alan developed a keen interest and knowledge of the region’s wildlife and landscape. Capturing his environment in paint, he admits is "a natural pursuit for somebody who just loves nature." Throughout Alan’s early childhood, he spent many weekends fishing with his late father, George, in Nebraska, where he developed his early appreciation of nature and the outdoors. In kindergarten, Alan began drawing on scrap cardboard, and in early high school his mother, Velma, arranged for a formal oil painting class by Taos artist, Darrell (Skip) Elliott. After many years of painting in both oils and acrylics, Alan has now settled exclusively into oil painting. Jim Wilcox, including his Master’s Class - Jackson, Wyoming. A 2012 high-light for Alan and Debbie was a personal visit with Howard Terpning. Alan grew up in northwest Kansas very close to where the setting for Howard’s famous painting titled “Digging In At Sappa Creek” was located. They shared memories of this historic area and many other interesting Native American stories. This was a day that Alan and Debbie will cherish for many years to come. For Alan, the creative process begins with extensive field experience. His unique understanding and vision are drawn from countless hours studying, viewing, sketching, and photographing the great outdoors and nature. Alan notes “The more I learn about painting, nature, and Native Americans, the more I find there is to learn." Alan thanks his parents for their early influence and introducing him to the great outdoors, his father-in-law, Curt Huitt for his tireless hours of joint productive field trips, and most of all, his wife Debbie, for her endless support. Alan Kruse’s art has received a great deal of recognition. From his gallery displays in Arizona, New Mexico, South Dakota, Montana, Kansas, and Colorado, to his multiple winnings of the "People’s Choice" award at the Kansas State Fair, his paintings now hang in private and corporate collections around the world. In addition, Alan is very honored to have his paintings selected for The Russell benefit auction in 2011 & 2013 (Great Falls, Montana). The journey continues for Alan, exploring the wilds of nature and learning the life of our Native Americans, while transferring their grandeur through paint for all to share.